Whilst looking through the new publications catalogues of Education books, I was pleased to find that many of the new titles are already available in the library. Also, many of the titles that haven’t yet been published have already been selected for purchase! For us, new titles don’t just mean brand new publications though; avid library users will know that we have many Special Collections, including our impressive Official Publications collection, which have lots of older and rarer content. Recent donations from Universities UK and City & Guilds have meant that many important documents have been added to this collection, some dating back to the early 50’s, so it been really is great to receive them. 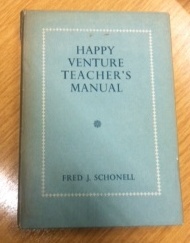 Another recent donation, by a former teacher, included a copy of ‘Happy Venture Teacher’s Manual’ by Fred Schonell, published in 1959. The Happy Venture reading scheme was very popular throughout the 1950s and 60’s so it’s really wonderful to have been given a copy of this book. Check our new titles link on the library catalogue to see item information about the hundreds of new publications we have in the library, and, if you have educational books or reports which you no longer want or need, just get in touch and let me know- you may be helping to fill a gap in our collection!